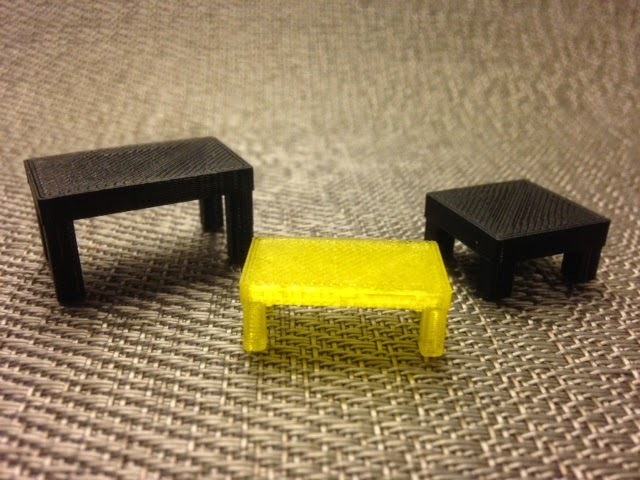 Continuing with our (procrastination of) planning for this summer's move, we printed our dining room table and two coffee tables. Settings: Printed on a Replicator 2 with MakerWare .3mm/low, upside-down so as not to require supports. Technical notes, OpenSCAD flavor: Continuing with the same parameters as yesterday's code, today we constructed a table module. Since tables are sharper than sofas we used smaller spheres at the corners. The result is slightly nicer than just using the very sharp cube() module that we used for the legs.